Since my most recent trips have been more reptile based I thought it would be nice to do the first amphibian based trip since I went to Portugal in February 2011. The Tyrrhenian islands of Corsica and Sardinia have a number of endemic species and subspecies, and not being able to do both at once I opted for the beautiful French isle of Corsica for my last field trip of 2012. I have wanted to visit this island for years, plans fell through several times with several different travel companions but finally Carl Corbidge and I decided to attempt to travel this massive island by ourselves. Corsica is truly one of the most beautiful places I have ever visited, with habitats so diverse as hot, dry Mediterranean lowlands to snow covered peaks with freezing lakes at 2300masl. Owing to the differing ecology of some of the Corsican herpetofauna we divided our trip into two parts: the mountains and the lowlands. For us the higher altitude and wonderfully forested mountain ranges held far more appeal and therefore we spent almost five of our days exploring these areas of Haute Corse. Owing to a smaller number of Mediterranean species we wanted to find (mostly snakes and one gecko) we spent two days in the southern coastal areas of Corsica at the end of our trip. Despite no heavy rainfall at all during our stay we could find every species but one, the elusive European leaf-toed gecko (Eulepes europaea ) left us scratching our heads since the night temperatures were certainly warm enough for the other two gecko species on the island, even in the mountains. While in the mountain areas it was often cloudy, occasionally foggy with temperatures hovering around 20C the Mediterranean lowlands dominated by maquis covered hillsides were at times very hot indeed (over 30C) which on one day was enough to send us to the beach for a swim. I am very grateful to my good herping friend Jeroen Speybroeck who helped me with locations for the trip, and his hints undoubtedly saved us a lot of time, especially considering the long driving distances and the slow mountain roads of Corsica. Carl and I took an early morning flight from Manchester to Bastia in the north of Corsica and after picking up our hire car we started the drive to our central mountain base at the town of Corte. Driving through the lowlands we were amazed by the abundance of Red Kites (Milvus milvus) and Common buzzards (Buteo buteo). Driving through some lower, sunny mountain areas we stopped for our first search at a roadside shady valley, which to us looked ideal for one lizard in particular. Straight away we spotted the first few individuals of Tyrrhenian wall lizard (Podarcis tiliguerta) which encountered in high number at every altitude. Soon afterwards we were fortunate to spot several individuals of the Pygmy algyroides (Algyroides fitzingeri) which is supposedly quite rare on Corsica. Pleased with this start we made our way to Corte, and after dropping of our luggage set out to the higher mountains in search of some endemics. Exploring a mountain brook we saw the first larvae of Corsican fire salamander (Salamandra corsica) a species high on our wish list. We decided to go for a meal and wait for night to explore the nearby beech forest. After dark we searched this area, with far more salamander larvae showing themselves by night we were disappointed not to come across any adults. I compensated for this somewhat by finding a male and female Corsican brook newt (Euproctus montanus). We expected to find more of this unique high altitude newt species during the trip, these turned out to be the only adults we found. After midnight we went to bed after a long day. During the daytime it was quite warm and we explored some hillsides near to our accommodation where we saw several Italian wall lizard (Podarcis sicula) together with the endemic wall lizards. We then drove higher up once more and explored several mountain streams not finding anything in particular except some tadpoles and freshly deposited eggs of the Corsican painted frog (Discoglossus montalentii) the species I most wanted to find. Back further down we caught a few individuals of the very common Pool frog (Pelophylax lessonae bergeri). 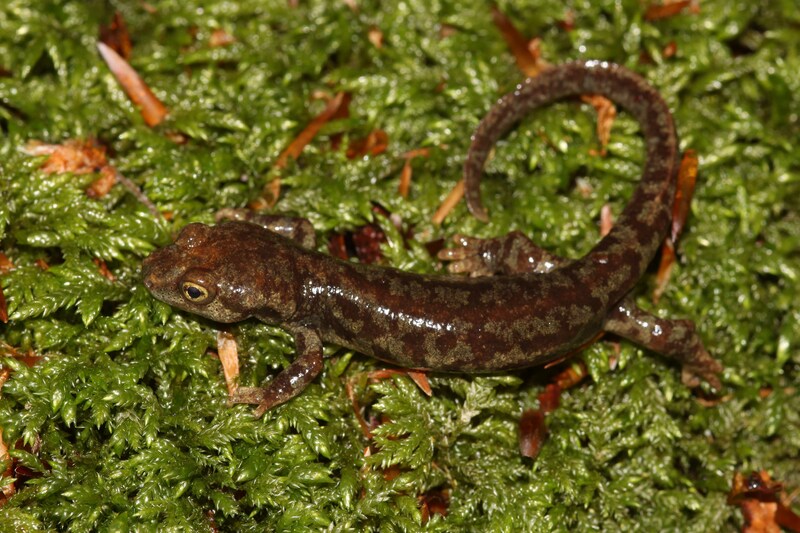 At dusk we drove back up the mountains for a salamander search, and this time I found a juvenile Corsican fire salamander (Salamandra corsica) under a stone, soon followed by several large adults which had just emerged and started wandering around the forest floor. Great! The late afternoon fog on this day was possibly the reason for these animals to emerge just as night was falling, as we had seen no sign of any activity at the same spot the previous evening. In the dark we hiked to the spot where we found the tadpoles of the desired frog, by the side of this small rock pool next to a waterfall we found a nice red adult that we decided to photograph at the spot the following morning. Overall a very successful nights work! On this day we decided to try and find the Tyrrhenian Rock Lizard (Archaeolacerta bedriagae) which generally occurs at high altitudes, even above the tree line. Driving the start of the trail to Lac de Nino we passed through some drier mountain locations which we decided to explore. As I was photographing a wall lizard sat on a rock pile I saw the tail of a snake disappear next to me, then an even larger snake emerged and made it’s way into a very pricky bush. Trying very hard to locate the snake in the dense bushes we finally had to give up on this particular Western whip snake (Hierophis viridiflavus). Leaving this area and driving onwards to around 2000masl we explored an open rocky hillsides where we finally found the first individuals of the desired rock lizard, and turned out to be larger than we expected. That evening we decided to have some beers in Corte instead of doing a nocturnal search, but while doing so spotted the first Moorish geckos (Tarentola mauritanica) although I didn’t have my camera with me. Awesome scenery with habitat of Western whip snake (Hierophis viridiflavus) on the left side. We decided to try and conquer the steep hike to Lac de Melo, one of the highest points on the island above the tree line with still some patches of snow. This was a truly breath-taking hike with amazing views, and although a little steep towards the end we managed to make it up to the beautiful lake. On the way I found another adult Corsican painted frog under a stone at the edge of a small brook, wall lizards and the odd rock lizard were also present. At the lake itself a group of Alpine choughs (Pyrrhocorax graculus) took food from Carl’s hand. After the long climb back down we had some lunch and set of back to Corte. At dusk we explored some streams and heard the first calls of the Tyrrhenian tree frog (Hyla sarda). Flipping some stones I caught a nice Sardinian painted frog (Discoglossus sardus) which is generally a more lowland species than montalentii. After a while Carl was able to catch a tree frog sat calling in some bramble for us to photograph. And a little higher still..
After our success in Haute Corse we left Corte and descended to the southern Mediterranean lowlands of Corsica with a combination of mostly dry, maquis dominated hilly slopes with some coastal wetlands and rivers. After a few hours drive we reached the coast where we stopped to examine a beautiful but sadly recently run-over blue Corsican grass snake (Natrix natrix corsa) a subspecies endemic to Corsica. After this disappointment we explored a nearby sand dune pond filled with hundreds of Pool frogs, thankfully Carl was able to find two large Grass snakes to make up for the road kill. Walking back to the car we spotted a basking Western whip snake in a hedge, throwing myself into the hedge and getting hurt didn’t result in this nasty biter being caught. After checking into a local camp site we pitched our tent and went back to this location in the evening when it was cooler to attempt to catch a fast whip snake. We carefully scanned each side of the road which had perfect basking potential in the form of strimmed piles of vegetation. Annoyingly when we walked back to the car a nice adult was found sat in the road, just hit by a car which left us to put it to death. After this disappointment we found some Turkish geckos (Hemidactylus turcicus) but sadly no Leaf-toed geckos, tree frogs were calling all around. At 9am it was already 28C so we knew this day would be a hot one. At the same site as the day before we spotted the first shy individuals of European pond terrapin (Emys orbicularis) a rare species in Corsica. Driving further on I spotted an adult Hermann’s tortoise (Testudo hermanni) about to wander into the road at a roundabout. Luckily I got to him just in time. Exploring a maquis hillside we spotted two more whip snakes, which were far too warmed up to be caught on this hot afternoon. After this we went to the beach for a swim for a few hours. Back at the camp site I caught a skinny sub-adult Western whip snake (Hierophis viridiflavus) on the drystone wall behind our tent. After dark, and being harassed by the lowland mosquitoes we found many tree frogs in a flooded cattle field, also several sat on the tarmac road (which we helped across). Also some Green toads (Bufo viridis) calling from the middle of this pond. Our last full day on Corsica we had a final coastal search in the morning where I was finally able to catch a nice adult Nasty biter (Hierophis viridiflavus). After this we decided to start the long drive back into the central mountains where we would spend the final night before our early flight home the next morning. Exploring some nice brooks again at higher altitudes with nicer temperatures we found two juvenile Corsican painted frogs as well as some more rock lizards. In the evening we decided to go to the bar instead of stalking tree frogs. I have to say my trip to Corsica was one of my favourite to date, and it is a place I will surely be visiting again in the future, as you may have noticed the scenery as well as the herpetofauna is quite spectacular there. In the end we found everything except the elusive Eulepes, although we probably didn’t try as hard as we could have to find it given our other nocturnal amphibian priorities. In addition we could only hear some calls of the Green toad (Bufo viridis) without finding any adults, which was quite low down on our priorities for this trip. Interesting stuff. Looks like you had a productive trip. Thanks Richard, Corsica is truly one of the nicest places I have ever visited! You won’t be disappointed! We also spent a week in Corsica in April 2012 for our honeymoon. Although we weren’t there to look for amphibians and snakes. We visited 3/4 of the island by road. We can see why this beautifull island gets flooded by tourists every year!! Will definetely do it again. I’m from the Italian Dolomites and love nature, currently living in South Africa. But must say, Corsica is one of my best spots. Maybe we’ll see you there soon? Corsica is a very beautiful place, one of the nicest that I have visited. I do wish to return to Corsica some day but at the moment I don’t know when that will be.